Earl "Mad Man" Muntz was a larger than life media personality known for his outrageous radio promos selling used cars in California. When he decided to manufacture his own cars, a.k.a. the 1951 Muntz Jet, he told reporters that they were faster than a Jaguar XK120. Actually, that might have been true. Muntz himself said they would do 150 mph, although his claim was never proved in any recorded road test. A classic car dealer, Westport Auto Center in Fenton, Missouri, has just listed this remarkable example of a 1951 Muntz Jet for sale. They say it is one of only four produced with the factory "Hop Up" kit. In other words, it came wth Edmunds aluminum cylinder heads and intake manifold and two dual Carter WCD carburetors. Futhermore, this Muntz 185 is the only one that was known to leave the factory with a Kaiser instrument panel. Most Muntz Jets had an engine-turned dash with Borg-Warner gauges. The Muntz Jet had been designed by race car builder Frank Kurtis. When hard times befell Kurtis, Mad Man Muntz bought the rights to the design and went into manufacturing them under the name Muntz Jet. The 1951 Muntz Jet caused a ripple of excitement in the new car market. 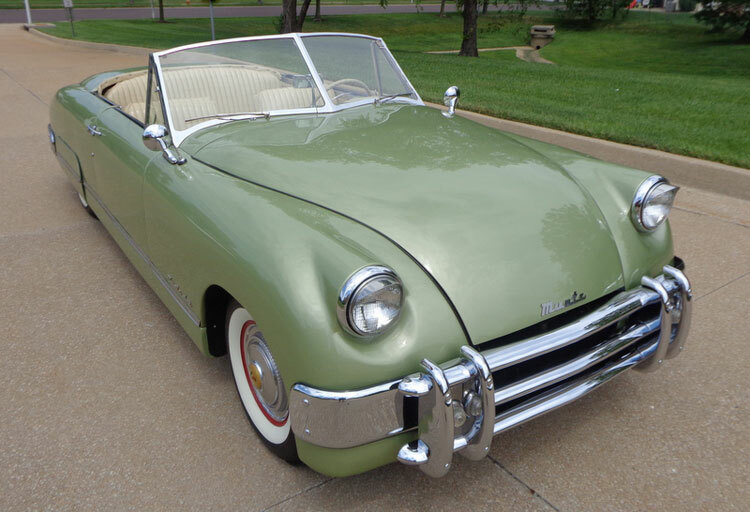 The Muntz was produced from 1951 through 1954. It is credited with creating a market for the personal luxury car. Although a number of celebrities purchased the cars, Muntz was never able to set up a network of dealers to sell them. In the end, about 198 cars were thought to have been produced. Today there may be as many as 50 of them in existence. They say 30 of them are in the Muntz Registry. The Muntz Jet introduced some standard safety equipment to the new car market of the early 1950's. They came with seat belts and all had padded dashes. Standard equipment included independent front suspension with A-arms and coil springs; a live rear axle with leaf springs; power steering; four-wheel hydraulic brakes and dual exhaust. At a $5,500 purchase price, the Muntz Jet was more expensive than a Cadillac or a Lincoln. A Muntz could be ordered in many colors, including Mars Red, Lime Mist, Stratosphere Blue, with one car custom ordered in bright chartreuse with mahogany planks affixed to the rear deck, like a yacht. Purchasers could order upholstery done in alligator, emu, leopard, or snake skin. It seems no two cars were ever quite alike. You could order one with a cocktail bar built into the rear seat center console. Suffice it to say that the Muntz was one of the most interesting cars ever produced in the U.S. For all the craziness around their history, these cars seemed to perform well and were dependable transportation in that era. They are ever increasing in value today. The stunning 1929 Duesenberg Model J Sedan looked like it was made of solid gold as it stood there on the auction stage at the Fall Auburn Auction. 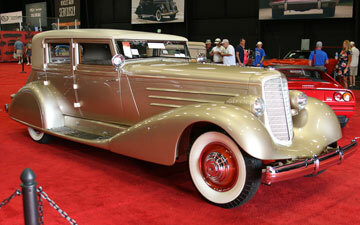 After sales commission this beautiful classic Duesenberg sold for $737,000. (Follow this link to read the whole story and see what other top cars sold for.) It was the second highest sale of the day. The top sale was a 1957 Mercedes-Benz 300SL Roadster at $852,500 (including commissions.) The Fall Auburn Auction is one of the last big auctions of the car show season. 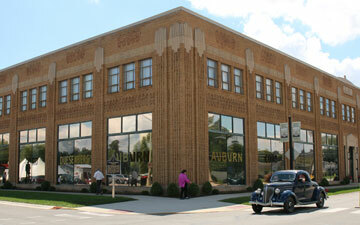 It fullfills a 48-year tradition of top auction sales here at the Auburn Auction Park. Cars-On-Line.com covered the event in photos and videos for our readers. During the auction on Saturday our readers joined in on an "auction watching party" using the live video stream from RM Auctions to follow the action and comment on our Facebook and Twitter pages. 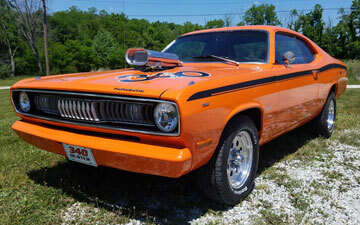 Remember this 1972 Plymouth Duster highlighted in our DEAL of the DAY features here in the newsletter two weeks ago? We said it was a good deal so it is no surprise that one of our readers had the same idea. Anyway, this week the seller notified us that it had already SOLD. The seller from Martinsville, Indiana knew he was offering it at a great price. We found it among the SOLD ads below in this newsletter today. Now the seller knows why we always say, "You can advertise anywhere ... but you can sell on Cars-On-Line." Follow this link to the SOLD section below. When you see how effective a Cars-On-Line.com ad can be, you may want to advertise your car with Cars-On-Line.com. Click here to start your ad now. When Larry Shinoda was given the task to upgrade the Boss 302 Mustang by Ford, he decided on a hybrid between the quick Boss 302 and the monster power Boss 429. 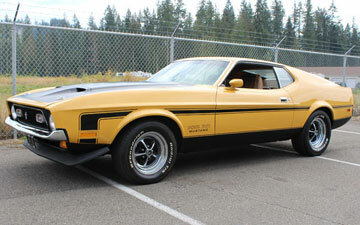 The resulting 1971 Boss 351 Mustang is a one-year only muscle car that may be the forgotten Boss. You can still buy them for way less than their other Boss ancestry. Here is one that was listed by a private collector from Granite Falls, Washington. He says it has been completely restored with new carpet, seat upholstery, door panels, headliner, etc. Check out the fit and finish. This one has the Top Loader RUG AV1 transmission with Hurst linkage. The color is E Code Medium Yellow Gold (pretty hard to find today.} Only 1,806 Boss 351 Mustangs were produced. Only nine with this interior trim and color. The price is very affordable compared to other year Boss Mustangs. One of the last big classic car auctions of the year will be the 2018 Fall Carlisle Auction in Carlisle, Pennsylvania, October 4-6, 2018. Carlisle Events says they will offer 500 cars during the three-day sale. The auction inventory is beginning to be published. Here are some of the cars our readers will be interested in. One of the top muscle cars to be offered at the 2018 Fall Carlisle Auction is a rare 1970 Chevrolet Nova SS L78 396 factory big block car. Creating 375 horsepower in a 4-speed factory hot rod was very appealing to the youth oriented new car buyers back in the muscle car era. This one comes with GM of Canada documentation. GM of Canada kept better records than we did in the U.S. Their documentation means a great deal to the value of this car. It comes with a Pennsylvania title. They say it has a 3.55 posi rear end. You don't see a 1941 Packard Clipper very often these days. 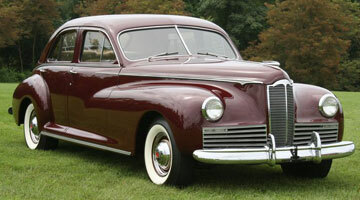 The Packard Clipper was a new look for 1941. Packard wanted to position the Clipper as America's new hot seller. Unfortunately, their timing could not have been worse. Since 1941 was the last year that American car companies would produce passenger cars, factories began shutting down for war production during World War II. The Clipper only sold about 16,000 cars because the new Clipper was not available until April of that year. Collectors know these Clippers are pretty rare. 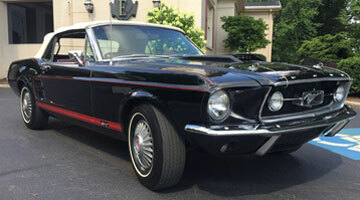 A 1967 Mustang GT Convertible with the S Code 390 big block motor would be a rare find in its own right, but this one being offered at the 2018 Fall Auburn Auction is Raven black with the red GT stripe. That is a very desirable look. They say it is one of only 645 S Code GT's produced with this trim code. It was originally ordered by a Vietnam veteran and comes with the military PX paperwork. The auction info indicates that the engine has been rebuilt. But this GT is said to be unrestored original with one owner and he tells us it remains numbers matching. 1956 Chevrolet Bel Air "Shorty"
Here is a list of current 2018 Fall Carlisle Auction consignments. For more information on how to consign your car or become a bidder at the auction you can contact Carlisle Events here. 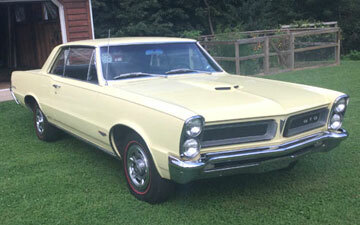 This week, a Pittsburg collector listed his 1965 Pontiac GTO and he says it still has just 36,800 miles. True collectos will be delighted to hear him say it still has the original interior. 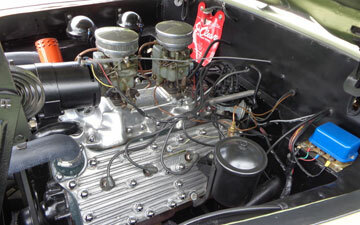 A look at the photos tells you the engine compartment is clean and it has a 4-barrel carburetor. He says it has a 4-speed manual transmission. The seller says it was repainted once in 1986. Price is reasonable for such a find. 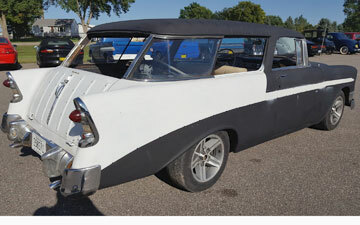 Unique Specialty & Classics out of Mankato, Minnesota just posted a project car which they just acquired. Here is a 1956 Chevy Nomad Wagon which is so fresh that they do not as yet have a desription posted on this one. Since Nomads are about the hottest classic you can find in this market, we knew this one would be of interest to you. For the right buyer this is a diamond in the rough. They are asking just $14,900. Be sure to have it inspected before you buy it. But hurry! A beautiful 1971 Olds Cutlass S show car with a glass-like one-of-a-kind paint job has been for sale for some time now in our muscle car section. 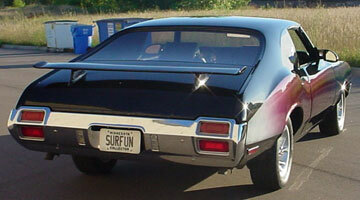 The back side windows are filled in with "surfer" graphics. And the beautiful triple pearled paint creates different hues of color as you look at the car from different angles and in different light. It is a stunning effect. Under the hood there is a 345 horsepower 455 big block motor looking all chromed as you would expect. The long and the short of it is this car was originally listed at $53,900. But this week the seller dropped his price by over $26,000. He will let it go for $27,771. Now that's what I'm talkin' about. Connecticut collector tells us this car has won some top shows. Only 23k miles, Skyhook susp. 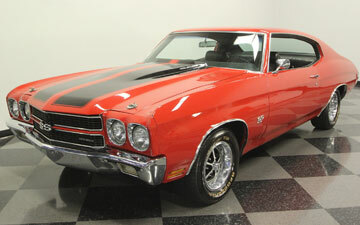 Hendrick Performance offers this nicely restored classic. California car, has a new clutch. Southwest car with full restoration and mechanicals. Just came out of storage, needs freshening. Take a look at the Boats Section. Each day's new ads are posted to the New Listings page. Says it runs and drives well. 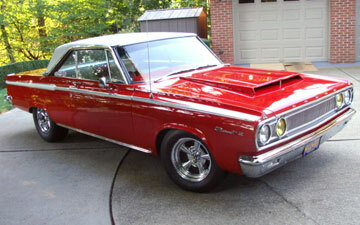 Says it is a real #'s matching R/T, runs and drives well. See hundreds more for sale in the Muscle Car Section. 1962 Chevrolet Bel Air 150, P.J. 's Auto World, hot rod sleeper! See more in the El Camino Section! Cool resto mod done right. One of 50 anniversary Super Snakes produced. Scroll through the Trucks & 4x4s Section for more. The newest ads come in on the New Listings page. Classic custom with on 530 miles on the restoration. Fully optioned, cold air, everything works. Fenton, Missouri collector calls it stunning, and says it is restored. Special Edition convertible LX 5.0 born to be collectible. 1962 Austin-Healey 3000 Sebring MX, P.J. 's Auto World, 355, more power! Orig Kentucky car, says it has flawless paint, nicely priced. Beverly HIlls Car Club offers a Grand Prix white 911 993. Go to the Porsche Section for more. See ads listed immediately on our New Listings page. Look for more in the Cars On Line Classic Sports Car Section. The Streetside Classics shop in Tampa, Florida has this extra nice 1970 Chevelle SS LS6 tribute with what they believe is a true original LS6 motor. Carefull attention given to making sure the functional cowl hood brings air into the special engine. Muncie 4-speed and 12-bolt rear end with Positraction. The DEAL of the DAY preview gives you first shot at all the cars that will be highlighted in the DEAL of the DAY feature on the Cars-On-Line home page. Often these cars sell in the newsletter before they even make it to the home page! You'll always see them here first though. Ford's forgotten muscle car, the 1969 Ford Torino GT, does not get the respect that the Mustangs get in the collector car market. So, for a first time buyer, these Ford Torino performance cars may have a lot of appreciation left in them. As discrete collectors look for cars that might escalate in their collector value the Torino GT should be in the discussion. The one you see here is from York Springs, Pennsylvania. It comes with a 302 small block with a shaker hood. They say it is a one-owner car which has been garage kept. It will be our DEAL of the DAY on Saturday since the asking price is just $18,000. What a find! 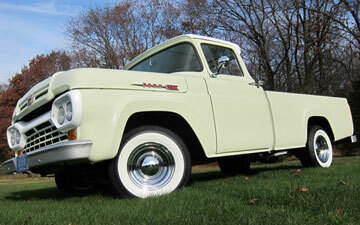 Here is a classic 1960 Ford F100 Pickup just listed for sale by a Waukesha, Wisconsin collector. He indicates that it is in original style condition with a 6 cylinder, 233 ci motor and 3-speed manual transmission. He says it runs and drives well with new wheels and tires. Notice the fresh Light Green exterior color and green interior, looks sweet in the photos. You will need to have it inspected in order to determine the condition class. You should note that there are about 100,000 miles on the car, according to the ad copy. But if it is in at least driver quality condition, the price is right. It will be our DEAL of the DAY on Sunday with an asking price of $14,795. Nostalgia race fans will really love this one. It is a 1965 Dodge Coronet built like a '60s factory race car. 500 ci Wedge motor was ordered from Indy Motors, complete with every option avaliable. 440 bored and stroked with Indy intake, Indy heads, TTI polished ceramic coated headers, Demon 950 carb, Hi Flow water pump, MSD pro billet distributor w/tight curve set, highspeed starter, and much more (read ad for entire list of specs.) But it is not all about the motor. See the photos to see the beautiful interior and carpet, new door handles, mirrors, bumpers, sub frame connectors, power steering, and tilt steering wheel. The 3" custom exhaust with custom header cutouts, built Torqueflite and stall converter are all signs of what this car is all about. It will be our DEAL of the DAY on Monday with an asking price of $26,000. I think you'll agree that's a lotta' car for the money. The difference between a Mercury Cougar and a Ford Mustang are predictable if you've followed the evolution of multiple brand automotive manufacturers. While the Ford Mustang is the more polular product, the Mercury Cougar was the sports car with muscle car appeal, but came equipped with creature comforts Ford did not bother with. 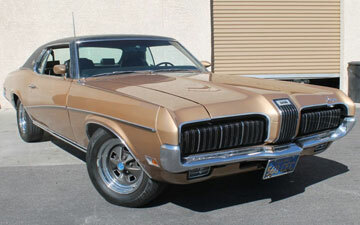 This 1970 Mercury Cougar XR7, for instance, has automatic transmission, power steering, power disc brakes, air conditioning, bucket seats, a console, tilt steering wheel and the popular sequential tail lights. It was also very stylish for the time with vinyl roof, leather seat upholstery and styled steel wheels. This one is said to be an original California blue plate car. Classic & Collectible Cars out of Las Vegas, Nevada is selling this interesting find. They say it remains solid and rust free. It will be our DEAL of the DAY next week because they are asking only $16,500. Chevrolet collectors like to think that only they had the ever popular "Bubble Top" styling on their 1960 and 1961 hardtops. But Pontiac collectors also claim the "Bubble Top" styling on their early '60s cars. They are just more rare than the Chevy's. 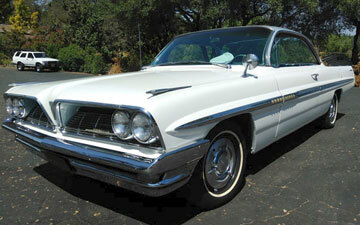 Here is a 1961 Pontiac Bonneville "Bubble Top" 2-Door Hardtop which has just been listed out of Auburn, California. The private seller says it is a real California original "black plate" hardtop with the same owner since the 1980's. You'll find the stock 389 V8 engine under the hood and an automatic transmission, power steering and power brakes, power windows and power seat. He says the interior is still stock original. Even the stock hubcaps and wheels are there. He says it has seen one repaint and comes with beautiful chrome and stainless. It will be our DEAL of the DAY next week with an asking price of $23,950. Here is an unusual one. 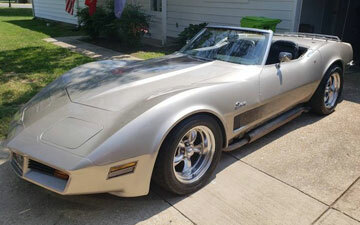 The private seller from the Joint Base at Andrews in Maryland is selling what looks like a 1970 Corvette Convertible which has been "morphed" into a 1982 Corvette Collector Edition. It looks great in the photos. He says it runs well, and that he has been able to get mechanical work done on it. The interior may need help. Also, the seller says there is bodywork needed. You may want to have it inspected before you buy. The ad says it has air conditiioning, iPod MP3 port and leather seats. This is an unusual find, maybe one-of-a-kind, in fact. It will have special meaning to the right buyer. It will be our DEAL of the DAY later next week. The asking price on this one is $13,000. We've noticed that the Mercedes-Benz SL convertibles are starting to gain traction in the collector car market this year. For many years the SL's just couldn't get any respect. There were too many of them available here in the U.S. They have more value in Europe. But values are beginning to increase at public auctions. 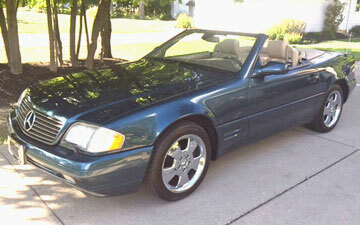 This week a 2000 Mercedes-Benz SL500 was listed by a private seller from Scottsdale, Arizona. 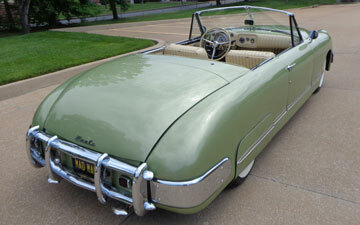 It has a Circon Green pearl finish with saddle leather interior, a power soft top and a matching auxiliary hardtop. The seller says it has cold air conditioning, and that everything is functional on the car. He describes it as being in "immaculate condition. Never in snow or smoked in." With an asking price of $16,500, it will be our DEAL of the DAY next Friday. Here's a 1972 Plymouth Duster which Cars-On-Line.com thought was listed for such a good price that they hand picked it as a "Deal of the Day" in last week's Newsletter. Some lucky customer thought the same and bought it! It's SOLD now. Here's another fast sale! Donald from Eaton, Ohio SOLD this beautiful 1964 Chevy Nova Gasser Wagon less than a week using the $45.00 Run Till Sold ad. 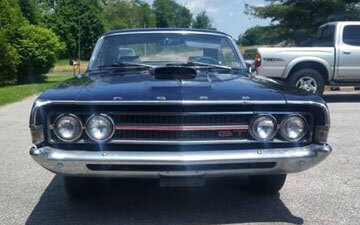 Charles from Shipman, Virginia said, "Cars On Line is great, best place to sell classic cars, thanks Cars On Line!" 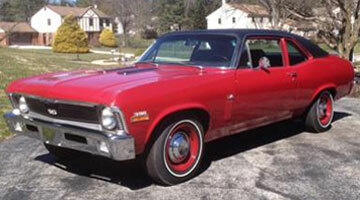 He marked his 1970 Chevy Monte Carlo SS SOLD using our very popular $45.00 Run Till Sold ad.